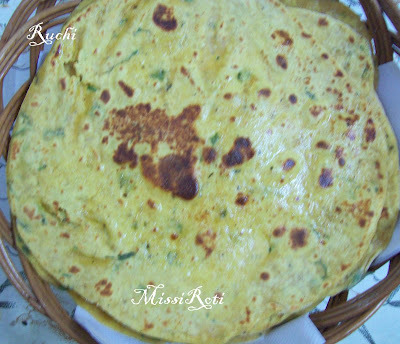 Missi roti is traditional Rajasthan dish prepared from besan or gram flour. 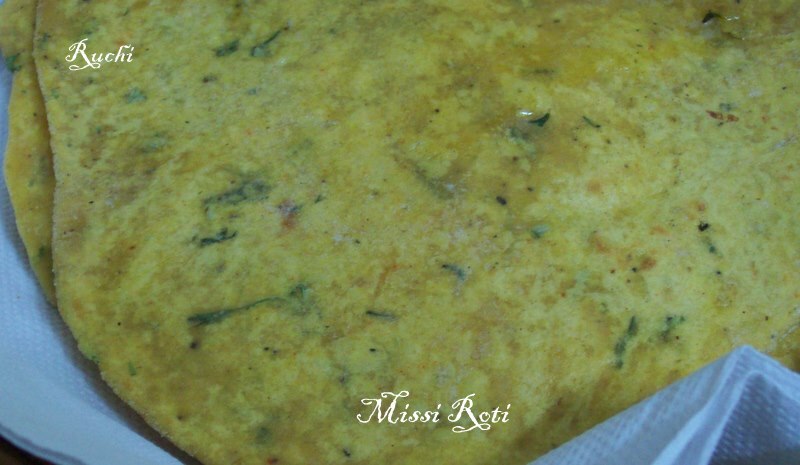 An excellent way of sprucing up the proteins in your diet, missi rotis are high in taste and health values. Adding besan in roti sounds so yummy and so different from regular plain rotis. This is a good replacement for chappathis . I prepared Rajasthani Missi Roti with my own touches and the family was pleased.It is quite a heavy meal. 2.Pound them to a powder.Add green chillies, onion, salt, turmeric powder, coriander leaves and mix well. Add sufficient water and knead. 3.Add one tablespoon of oil and the pounded spice powder and knead into a dough. Cover and rest the dough for about fifteen minutes. Roti looks simply inviting and prefect..